The Crank Brothers Candy 1 features one piece composite body with stamped steel wings for durability and increased stability. 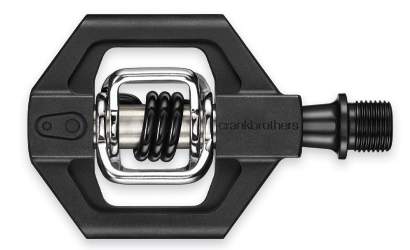 As with all Crank brothers pedals, the Candy 1 is fully rebuildable and simple to maintain. Its small platform and light weight is perfect for cyclocross. Weighs 262 grams per pair. The included pair of AllAccess cleats fit SPD bolt pattern. A set of premium brass cleats and shims included.